This project by Canadian company Bridgeable is a Service Design Award 2017 winner for the Best Commercial Project. Customers can really hate renewing their mobile phone contract. 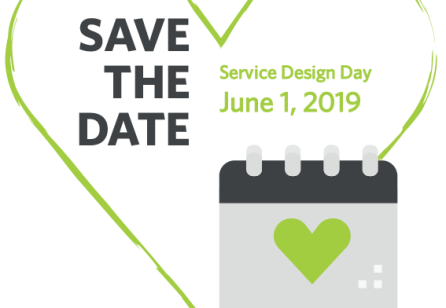 In 2015, the service design team at TELUS, one of Canada’s largest mobile service providers, worked with Bridgeable, a service design consultancy, to reimagine and redesign the experience. Together we worked to make renewing a mobile phone contract much more satisfying for customers, while significantly reducing cost for TELUS. Most people hate renewing their cell phone contract. The extent of their unhappiness is well understood—and there is concrete data to back it up. Customer experience scores, such as likelihood to recommend (L2R) consistently ranked amongst the lowest across the entire enterprise. Meanwhile, the operational expenditure (OPEX) per customer during a renewal was high as the average customer would call 6 or 7 times per renewal. This is the story of how Bridgeable, a service design consultancy, and the service design team at TELUS, one of the three largest mobile service providers in Canada, worked together to make the renewals experience more valuable for customers while radically reducing the cost to serve. OPEX for cell phone renewals breaks down into expense by channel. More expensive channels include call centres and retail stores. Alternatively, digital renewals are much less expensive. For TELUS, a renewal completed online reduced operational costs by up to $142 per customer. Additionally, the few customers who had renewed online tended to rank their experience much higher. Based on this data, the answer seemed obvious; TELUS needed to put more resources into their web experience, improving usability and adding functionality. But after making major digital investments to the renewals web experience, they weren’t having the intended effect—customers were still renewing their mobile contracts by calling TELUS’s call centre or visiting a retail store. To add to the pressure, in 2015 regulatory changes meant that all Canadian mobile providers, TELUS included, were about to face a “double cohort” of contract renewals. Canadian regulations were changing to discontinue three-year contracts with a new maximum of two-year agreements. This freed many consumers to seek new contracts, but it raised the cost burden of subsidy for providers, which drove up the cost of service. TELUS was facing a big problem: more customers looking for new contracts, higher up-front costs of hardware subsidies due to shorter contract periods, and a customer reliance on high cost channels. TELUS knew they needed to do something to improve the customer experience of renewals. 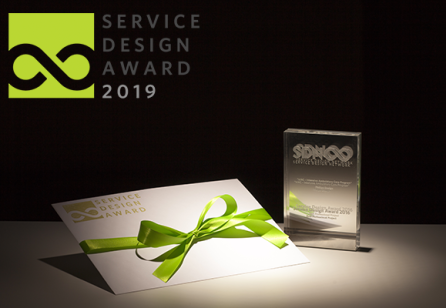 The internal Service Design and Customer Experience Management team were provided with this challenging mandate and partnered with Bridgeable to approach this challenge in a whole new way. 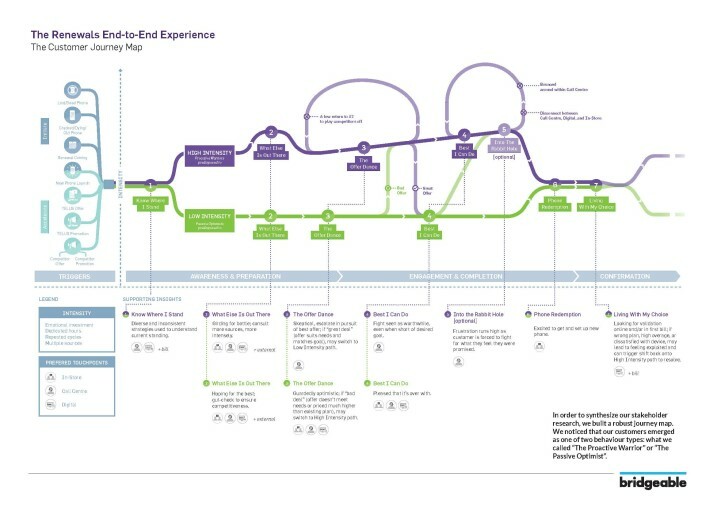 When Bridgeable and TELUS’s Service Design team began user research, we found that we needed to approach renewals from a more experiential point of view. There was a pervasive understanding that customers tended to choose one of the available channels and they would stay within it to pursue a contract renewal—starting and ending by calling their call centre, for instance. However, in talking with customers, we found they could start out by calling TELUS, then do some web research, and then finally renew in person in a store. Or they could start in a store and end up on the web. Rather than looking at their service as offering multiple options, TELUS needed to view renewals as an omni-channel service. In fact, if customers didn’t see consistency across channels then they would feel that they were not getting the best possible price and would escalate their effort, calling in to negotiate, driving up the cost to serve. We began our project by enlisting the help of a cross-section of TELUS managers; everyone responsible for a section of the renewals experience - from different channels, to operations and enabling infrastructure - were brought together into an internal task-force that would collaborate throughout the project. At first, some of these stakeholders were reticent; why would the person responsible for marketing be in the same room as the person responsible for database management? It soon became clear, however, that a cross-functional team would be able to make the necessary changes to the customer experience. Through this team, we built a strong governance model to guide the implementation of our new solutions. 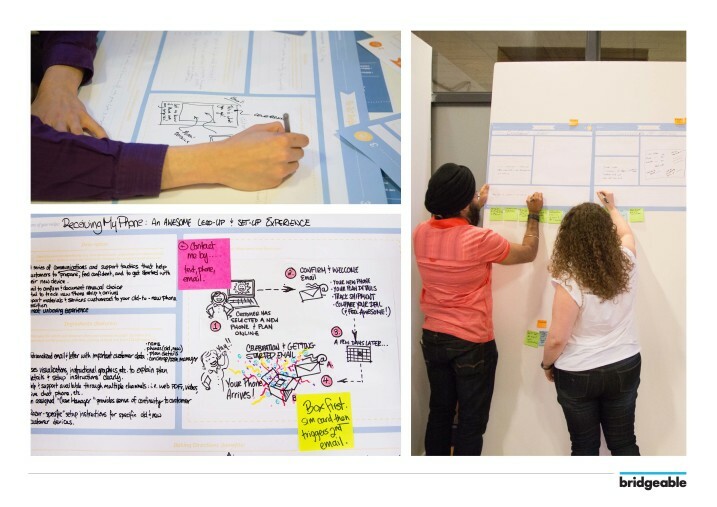 To start building out the contours of the customer experience, we held a series of research labs - two sessions for customers and one session for TELUS frontline staff. 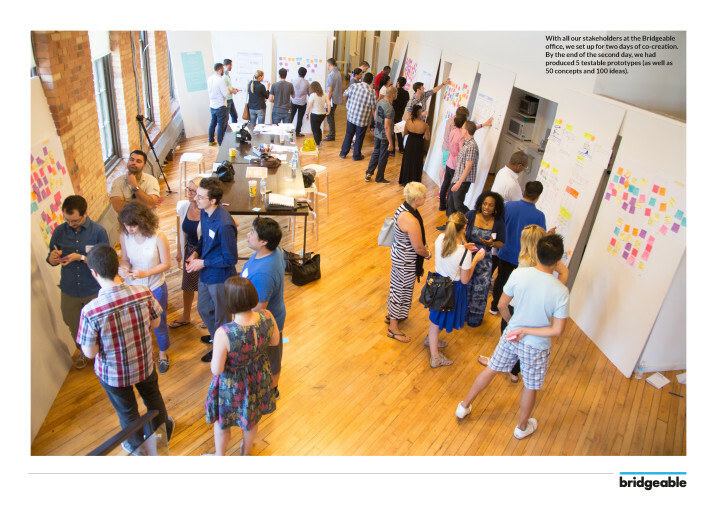 In these labs we prompted customers and staff to build out their own journeys using mood cards as design probes. By having customers read out their journeys to each other, we were able to understand the consistent behavioural elements. By having frontline staff partake in the same exercise, we saw the consistencies and incongruences in the service offering TELUS was providing. For example, call centre representatives talked about customers being disappointed by an offer, and wanting to haggle with them. Retail employees described times where they were undermined by a better offer from a call-centre representative. By taking a customer view and bringing together the people who were responsible for different points along the journey we could see the big picture of the overall experience. 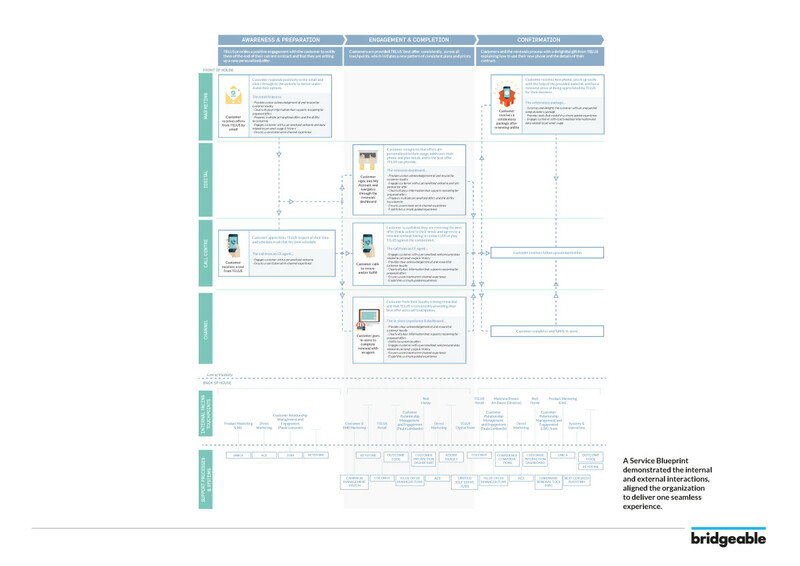 In order to synthesize our stakeholder research, we built a robust journey map. We noticed that our customers emerged as one of two behaviour types: what we called “The Proactive Warrior” or “The Passive Optimist”. Proactive Warriors do as much research as they possibly can, calling multiple times or showing up in multiple retail locations with new bargaining chips. Passive Optimists would choose their channel of choice and hope for the best. We mapped the journey according to the intensity of each of these types of customers, with the higher intensity warriors using multiple sources, repeated cycles, dedicated hours, and emotional investment as ways to seek a better deal. There were a few points where Proactive Warriors could become Passive Optimists, or viceversa, depending on the situation. If a Passive Optimist receives what they perceive as a bad offer, for instance, they might escalate and seek further interaction with call centres and stores or go outside to competitors for negotiation leverage. In order to address issues like these, we moved into a co-creative phase, building out the different channels as touchpoints of a service. Knowing that customers did not stay within a single channel during the renewals process, we could see that we needed to design an end-to-end experience that TELUS could collectively implement. For each channel, we focused on a series of touchpoint-level prototypes that would work together to create this experience. 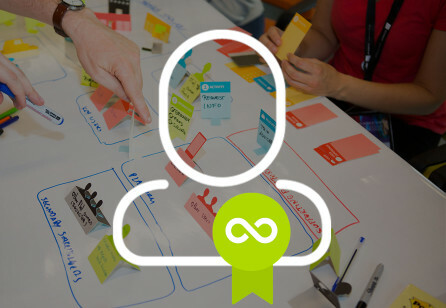 But to make sure these would be user-centred, and that they could actually be implemented, we needed to co-create our solutions with customers and a wide variety of staff. For the first time in TELUS’s history, we brought staff from multiple channels together with executives and customers to build a comprehensive end-to-end experience. On day one, each group built initial concepts and designed a set of features that would satisfy specific customer needs. After the session, the Bridgeable staff stayed in the office late into the night to build these concepts into low-fidelity prototypes and to tie them into an overall experience. Then on day two, each prototype was presented to all attendees for critique and iteration before each group went back to their rooms and re-built their prototype based on user feedback. At the end of co-creation, we had each group present their prototype to a panel of TELUS’s top executives. Beyond getting very detailed and cohesive experience prototypes, the co-creation also created buy-in across all our key stakeholder groups: channel employees could see the customer’s experience, managers could see how the channels were competing, and executives could see how these groups needed to work together to improve L2R scores and to reduce OPEX. We also achieved some quick wins when TELUS’s digital director left the co-creation with prototypes in order to start implementing them right away. Throughout our research and co-creative sessions, one insight truly rang out; people did not trust that they were getting the best offer on the website. They assumed that the web offer was generic, and that they could negotiate a better deal with a person on the phone. Our prototypes addressed this problem in a few key ways. Despite taking place in separate channels, each of our five prototypes shared some key features: using AI we created an algorithm to generate a personalized offer that stays consistent throughout all channels. No matter where the customer chose to seek out their new plan, the offer would be the same, even if they switched channels. So customers could now be confident that if they chose the website for their renewal offer, it would be the same as high-cost channels like call centres or retail stores. In a proactive email offer, the customer would see high, medium, and low cost options based on their previous bills that was available in a usage dashboard. This same information would remain consistent on click-through to the website. Our proactive calling system, where a call centre rep reaches out to a customer before their contract expires, included a 2-way SMS asking if the customer wanted to talk at that moment or if another time would be better. And when they did talk, the call centre rep had access to the same personalized offers as other channels. In store, a retail associate would walk the customer through their personalized offers and answer real-time questions. The web prototype offered a distinct new feature: a personalized chat assistant, with the option for an online call. Having the option to talk to a real person at any time gave customers confidence to complete their renewal online, even if they did not actually use this feature. Just knowing the option was there was reassuring that they were getting a consistent offer. Our prototypes integrated into a larger omni-channel service that the customer would take to renew their phone, even to the last touchpoint where they receive their device and set it up. This point of receiving and setting up a new device was a perceived barrier for some people to conduct an online renewal. Not having someone there to help with the setup of the new phone made an online renewal unappealing to some customers. To solve this, we prototyped mockups for a special unboxing experience that would seamlessly guide users through the process of activating a new phone. To validate the entire renewals journey, we created a video that walked through the experience from end-to-end. The video was useful in validation sessions to show customers and staff the service as we had built it out, and also went viral within TELUS, creating even wider organizational buy-in and excitement than we had initially expected. As our prototypes were validated and refined, we turned to the task of implementing our solutions. At this point the stakeholders that had been involved since the beginning were ready to take action! The internal Service Design and CEM teams were critical to ensuring that the project kept momentum and was pulled through. The online live chat was easiest to implement, and went to market within a few weeks. Other parts of the process took more time to roll out, but saw results quickly. Personalized communication emails produced exceptionally strong metrics – emails had consistent 50%+ open rates, and new emails received 2x click-through rate. These are best in class for TELUS and well above industry benchmarks. Shifting from call centres to 2-way SMS reduced effort — for both TELUS and the customers themselves. Contact duration was reduced by >10% and conversion lifted by up to 15%. All of these front-end metrics were leading indicators that the AI generated customized offer was valuable to TELUS customers. It also showed us that people could move away from relentlessly calling in to renegotiate, to more seamless movement across lower-cost channels. For example, moving from an e-mail offer to an online renewal, or from receiving a 2-way SMS to call-centre renewal. 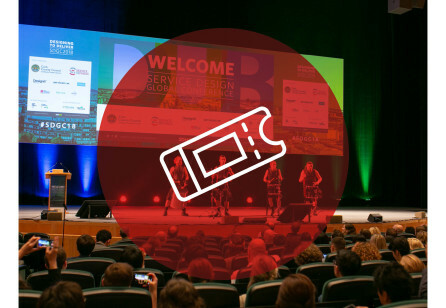 Designing this level of seamlessness was only possible because we applied a service design approach. Our unboxing prototype ended up becoming its own distinct project, where Bridgeable and TELUS worked together to create a new way for customers to experience having their new phone shipped to them and setting their new device up for the first time. It’s been a full year since TELUS implemented these new renewals solutions, and we’ve seen dramatic results. TELUS is seeing marked improvement on all their customer satisfaction scores from the people going through the newly designed experience, exceeding expectations. The Likelihood to Recommend (similar to NPS) scores shifted to being consistently in the top 2 boxes of customer satisfaction from being ranked at the bottom. We also increased customer satisfaction ratings (CSat) by 20% (as measured by surveys after the completion of the entire journey). And what’s good for customers is also good for the business. By shifting renewals customers to less expensive channels, TELUS has seen a 15% improvement in end-to-end cost reduction— and with 7.5 million post-paid customers renewing every two years, that will add up to significant cost-savings for TELUS. In the end, the customers who deal with this renewal process have the benefit of a seamless experience, consistent offers, and a host of user-friendly features that set TELUS apart as a leader service provider.